Cllr. 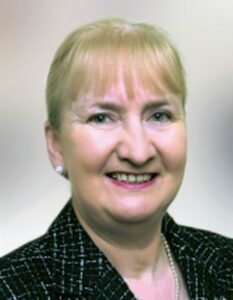 Mary Hilda Cavanagh was first elected to Kilkenny County Council while still a college student in 1974 and has held a seat for Fine Gael in North Kilkenny for forty years. Mary Hilda was twice Chairperson of Kilkenny County Council (1983-84 and 2004-2005) and twice Vice-Chairperson (1982-1983 and 2013-2014). She is currently a member of the Association of County and City Councils. A teacher by profession (teaching economics, history & mathematics), Mary Hilda left teaching to be a fulltime Councillor in 1988. Mary Hilda has been a member of Co. Kilkenny VEC (now Kilkenny and Carlow ETB) for forty years, chairing the Committee for twenty years. She is a member of the Steering Committee of Education & Training Boards Ireland (ETBI). Mary Hilda is also a member of the Governing Authority of UCD and the Governing Body of WIT. She is a current/former member of the Boards of Management of the following schools: Coláiste Mhuire, Johnstown; Castlecomer Community School; Abbey College Ferrybank; Grennan College, Thomastown; Duiske College, Graiguenamanagh; and Galmoy National School. A qualified Adult Literacy Tutor, Mary Hilda is a Member of the Executives of AONTAS and NALA and a former Chairperson of the County Library Committee. Mary Hilda was the first ever Chairperson of the County Development Board. She is a former Chairperson of the South Eastern Regional Arts Advisory Committee and has served on the South East Regional Authority. A member of the IFA, Mary Hilda farms with her husband, Eddie, in Galmoy and is a former Vice-Chairperson of the County Committee on Agriculture. She has three children: Sarah, Anne Marie and Brian. Her main hobbies are gardening and walking the dog.